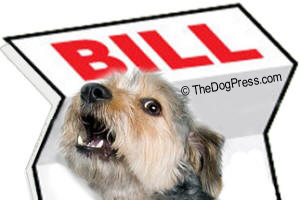 Do you use supplements for yourself or your dogs? 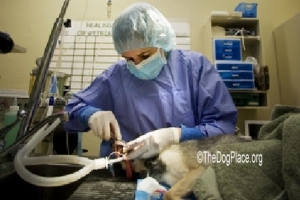 Do you have a pet on veterinary medications, do heartworm prevention, or immunize your dogs yearly? What about you? Are you on prescription medications? Do you know why? Are they helping? Do you take flu shots or other immunizations? Okay, I heard that. Two out of three people answered "yes". So let's agree there are life-saving drugs such as heart and diabetes medications but did you know that holistic practitioners say there are better, cheaper, and safer ways to control such ailments and strengthen the immune system? 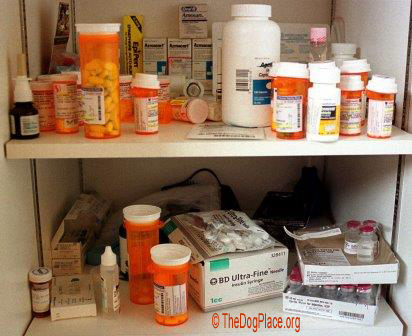 If your medicine cabinet is beginning to look like this, curse whoever named it "medicine" cabinet and get a dose of reality. But here's the thing. Like most people who show and breed, I learned how to condition my dogs and horses. Some of you will remember that in the 50s and 60s, we didn't have much in the way of doggy vitamins or shelves crammed with packaged dog-food. I raised a lot of All-Time top winners, sires, and dams on meat, eggs, fish, veggies, and commercial dry food, in that order in their diet. My seven Toy Fox Terriers get exactly the same diet today. Five of them have never seen a veterinarian except to get a rabies shot and certificate. The only "booster shots" they get are one mid-life rabies shot and a DHLP for my girls. First, I've proven that vibrant good health is critical to winning Groups and BIS. If your campaign dog is well-fed, well-conditioned, happy, and well-presented, he can win on type, soundness, and breed character. He will naturally sparkle as he says "I'm the best!" I know. Been there, done that. So the only thing I'm "selling" is something you can't buy. It's called common sense and experience. What goes in comes out and manifests in vibrant good health, glossy coat, and "vim and vigor" that doesn't come from a bottle. That extra edge we take into the ring is radiant good health, okay, and that special "bait" that's like a lucky charm to us. Hey, some people actually do take a lucky charm on belt, wrist, pocket. Picture this, me, Bill, and Carlos Rojas sitting in our van in sweltering heat at an outdoor show in Georgia. 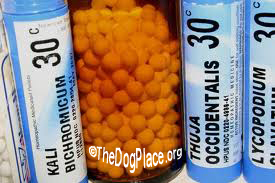 Carlos confided in us that his Dobermans glowed and were full of energy from bee pollen! At first we were skeptical but then I realized there was truth to that. My daddy was a bee-keeper and so I know a lot about honey and pollen. Carlos said he used a pollen product marketed for race horses. Devil D, Dino, and other truly great Dobermans comprised a long history of winners. Carlos himself had that "something special" - part of which was a handler's love and unwavering enthusiasm for the sport and the dogs. Was bee pollen his lucky charm? Some would say so. 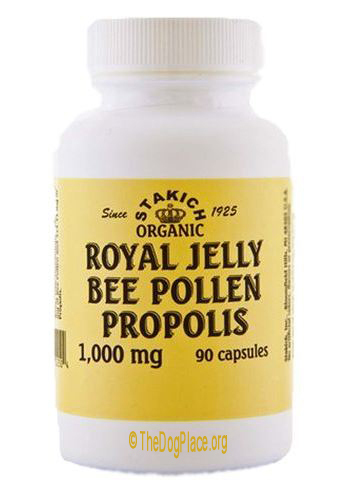 Speaking of bee pollen, in 2012 all the networks pimped the A/P feed that said "Experts are warning that taking natural bee pollen supplements may come with the risk of suffering a serious allergic reaction, including life-threatening anaphylactic shock." No doubt the use of honey and bee pollen cut into prescription medication sales and let's face it, pharmaceutical companies are the most lucrative advertiser for TV, print and internet publication. Bee pollen fell from favor but I've got news for you. 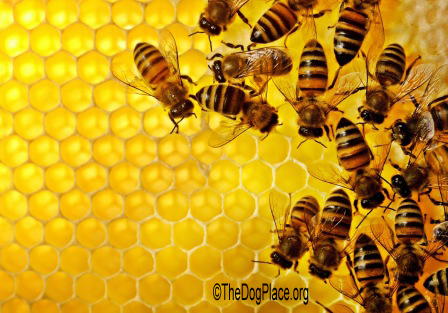 Google "thedogplace.org bee pollen". You're probably thinking of someone who shared their favorite supplement-secret with you. For Carroll James and Timmy, the top-winning Bulldog he handled, it was banana for bait. Indeed, I did some research on bananas and learned they are actually "mood food". We published an article about it but I doubt Carroll knew that. He just knew it worked and messy or not, like any good handler, he related to his top dog. Google "thedogplace.org mood food"
So most exhibitors have discovered something that gives their dogs that extra bloom needed for the show ring. I would avoid any doggy supplement that claims to add "energy" but certainly there are herbals that do boost energy in people. One such product made headlines when it was banned in 2004. 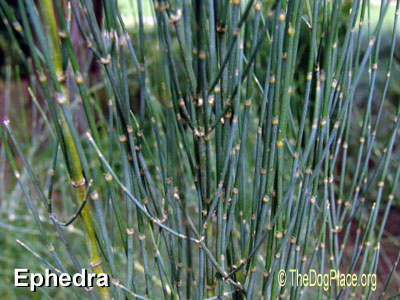 Ephedra is an ancient "Chinese Medicine" herb used for expanding bronchial tubes, thus treating asthma and what we now call COPD. Like many such herbal supplements, Ephedra was so effective for weight loss and energy that it got in the way of prescription diet drugs so of course it was banned by the FDA! Americans spend exactly 10% less on herbal supplements and homeopathic remedies than the $400 billion we spent for prescription drugs last year. Even so, FDA slams anything that threatens pharmaceutical sales. You don't see ad after ad for herbal supplements or homeopathic remedies in magazines, especially those you thumb through when you're waiting in the doctor's office. OK, so why then do you think natural supplements such as you can find growing in a pasture or shady woods (think mushrooms) have "been around forever"? Homeopathic remedies continue to be used by savvy people. Could it be because they are so inexpensive that people can afford to experiment, to find what works best for them and their pets and livestock? Or is it because homeopathy, herbs, and natural remedies have been used since before man could record history? Science today has proven the symbiosis and knowledge of natural remedies in ancient civilizations who survived without a single piece of "script" from the medicine man. Today we loosely term healing herbs and plants as Herbal Medicine, Botanical Medicine or Chinese Medicine. All are indeed medicine; they are what nature provides for healing, for cleansing, and most of all, for optimum health. I'll leave you with a funny twist. Penicillin, one of the most valuable antibiotics, is just mold and one of the best pain relievers is Opium, the juice of a poppy seed. You probably get both when in the hospital. Hashish is a potent derivative from cannabis plants, a much more potent form of marijuana, and it too is made into "prescription drugs." Before you ask, Native Americans smoked other species of tobacco, probably because marijuana was not native to North America. Well, that's all I know about natural medicine. It's been enough for me, what about you?